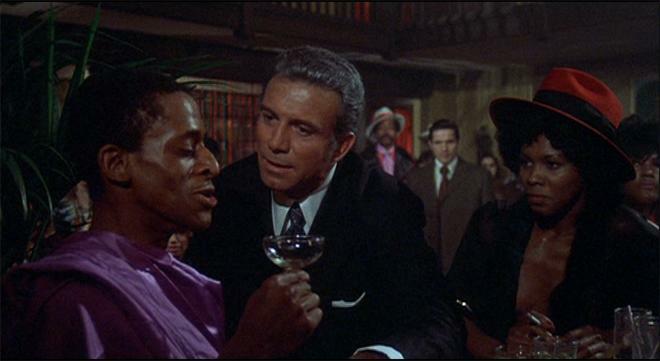 If movies were judged purely by the sheer awesomeness of their themes songs, then 'Across 110th Street' would easily be a five-star flick through and through. Seriously, listen to this and tell me that you won't be humming that tune for days. I know I will. But alas, film criticism can't rest on catchy melodies alone. After all, there are other things to consider. Silly things like the script, direction, and performances. And while none of those aspects can measure up to the blissful brilliance of the movie's title track, the film remains a solid urban crime thriller that doesn't pull any punches. Sure, some elements of the 1970s production are a little dated, but at least the movie's cinematic style manages to hold up a bit better than the characters' wardrobe choices. 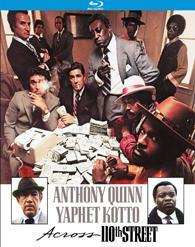 When three low-level Harlem crooks rob the Italian mafia, the ripped off gangsters seek violent retribution. 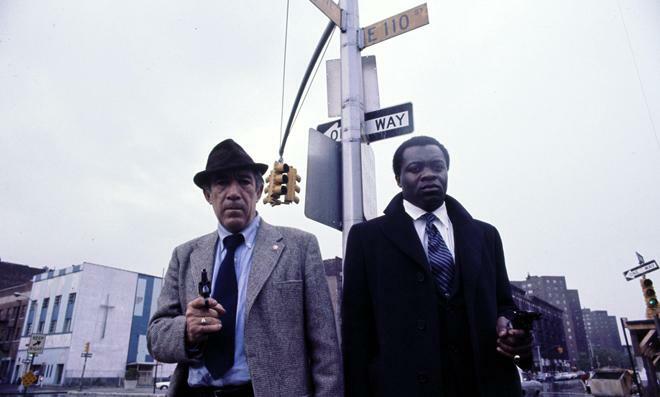 As the mob sets out to investigate the theft, two New York City cops, Lt. Pope (Yaphet Kotto) and Capt. Mattelli (Anthony Quinn), hit the case as well. But with tensions rising and a whole bunch of cash on the line, will the police be able to catch up with the criminals before the gangsters enact their own form of deadly payback? With its old school style and Blaxploitation elements, the film fits firmly within the crowded echelon of low budget 70s crime thrillers. The story is pretty basic but engaging, transitioning between the mafia and police's dual investigations -- with the cops seemingly always one step behind the crooks, and both parties ready to use decidedly brutal tactics. Likewise, a good emphasis is also placed on the trio of small-time thieves who incite the plot, highlighting some of their desperate motivations (and stupid mistakes) as they go into hiding. And joining the standard crime thriller beats, is a fairly effective layer of social commentary that plays up the growing racial tensions that rest at the heart of the drama. Visually, the movie also packs a solid punch, making the most of its rough aesthetic with a few potent stylistic choices. To this end, director Barry Shear offers some frantic handheld shots, lively zooms, dramatic low angles, and deliberate cuts to enhance the action and suspense. For instance, the initial heist scene features some uneasy close-up cuts that transition between the characters' nervous faces right before the bullets start to blaze, perfectly anticipating the explosion of violence through escalating editing. And all of the subsequent action scenes prove to be appropriately gritty and raw as well, leading to some bloody shootouts and unsettling interrogations. Unfortunately, not all of the movie's narrative and cinematic elements have stood the test of time. 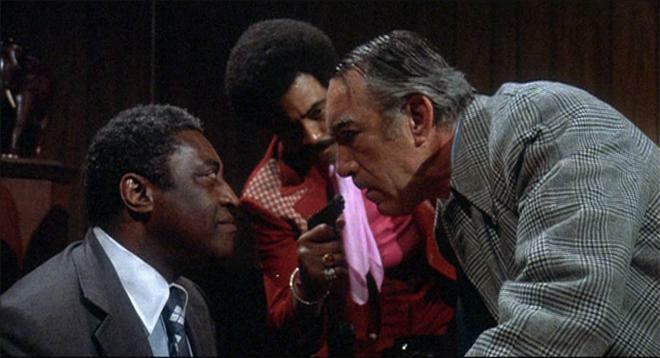 While stars Anthony Quinn and Yaphet Kotto both turn in strong performances as the morally ambiguous Mattelli and the ethically steadfast Pope, the script never gives either one of them enough focus. This makes their heated conflicts feel underdeveloped. They both have a great scene or two together, but their relationship never really adds up to much. To this point, the movie bounces around too often to ever really establish a central protagonist, and this makes it hard to invest fully in the story. Despite the copious violence, the pace is also a little on the slow side and all of the characters and plot twists adhere to typical crime thriller clichés. And though the film's social commentary is decent, the racially charged observations aren't fleshed out or particularly nuanced, making the not so subtle closing shot come across as a little forced. 'Across 110th Street' is a bit rough around the edges, but this gritty, old school style is part of what makes it unique. As far as 70s crime exploitation flicks go, the film offers a satisfying helping of action, style, suspense, and even a little extra layer of social commentary. Some elements are dated but fans of the genre will likely find a fair amount to admire here -- and even decades later, that title song still never gets old. Kino brings 'Across 110th Street' to Blu-ray on a single BD-25 disc that comes housed in a keepcase. After some logos and warnings, the disc transitions to a traditional menu screen. The packaging indicates that the release is region A coded. The movie is provided with a 1080p/AVC MPEG-4 transfer in the 1.85:1 aspect ratio. The source print is in pretty good shape with no major signs of damage. A moderate to heavy layer of grain is also visible, but its appearance can be a bit noisy and fuzzy. Though detail is solid, the image has a relatively soft and occasionally hazy quality. Likewise, depth is on the flat side. Colors are nicely rendered with a natural urban palette that offers decent pop with bolder primaries. Unfortunately, one of the main drawbacks to the picture involves its black levels. Blacks and shadows veer toward a sometimes blue and noisy hue that makes dark scenes a tad distracting. Whites can look a little overexposed and blown out as well. While damage is minimal, the transfer still features a rough, low budget quality. This isn't a particularly impressive image, but it gets the job done just fine and many of the issues here are likely inherent to the source. The film is presented with an English DTS-HD MA 2.0 Mono track along with English subtitles. With no major age-related issues, this is a very solid track that comes through well. Though limited by its age and budget, dialogue is relatively clear throughout and there are no notable instances of crackles, pops, or hissing. While mostly flat compared to modern tracks, the mono audio still offers decent range. Action oriented scenes in particular, carry an effective jolt, bringing a welcomed pop to every gunshot. Likewise, music features good fidelity, properly highlighting Bobby Womack's iconic title track. The audio mix here is clearly a product of its time and budget, but the track is presented well and there are no technical problems. Theatrical Trailer (HD, 3 min) - The film's trailer is included in 1080p with DTS-HD MA 2.0 sound. 'Across 110th Street' is a solid 70s crime thriller that offers a bit more than your standard low budget exploitation flick. Certain elements are still dated and a little problematic, but most of the runtime is relatively engaging. The video and audio both show signs of the film's limited production, but they get the job done. Sadly, the only supplement we get is a requisite trailer. While this isn't exactly a stellar disc, the film itself has merit and fans of the genre will want to check this out. Give it a rent.